Kpreps.com would like to congratulate Susan Goodwyn for submitting the winning photograph for Week 9 of the Kpreps Friday Night Photo Contest. 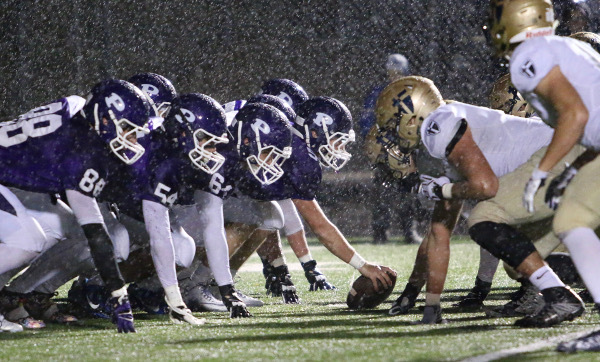 The photo captures Pittsburg and St. Thomas Aquinas playing in the elements for a district championship. The Saints won 35-3 in a game that featured numerous turnovers due to the wet, windy conditions. Rain played a big role in several games across the state in Week 9 as teams competed to qualify for the state playoffs. For this winning photograph, Susan remains eligible for our 2015 Grand Prize including $500 in cash. Each week during the regular season and playoffs, Kpreps will select a winning photograph that will become eligible to win the grand prize. This means there will be 13 photos chosen as finalists for the 2015 contest. Only weekly winning photographs will be eligible for the grand prize! Weekly winners will be featured on Kpreps.com and receive a consolation prize at the conclusion of the season.